This charming mansion house/castle is located in an exceptional and historical site, only 5kms from the town of Aurillac and 2 kms from a charming little village. This beautiful 12th century Château is secluded, ensuring your privacy in this amazing location, surrounded by trees and nature. In this fabulous one-hectare surroundings, nothing will disturb your peace! And yet you are only 10 minutes from the city centre of Aurillac where you will find everything you need! Recently renovated the house can accommodate up to 16 guests in 5 bedrooms (3 en suite). Possibility of accommodating additional people. Please ask for further details. You access the rooms from a 12th century donjon and enter directly into a large dining room (100m2), with a ceiling height of 4 meters adorned with big traditional beams. At the far end of this room you can admire a “Cantou” (huge fireplace in the local dialect). Guests can gather around it to spend a friendly and warm evening on front of a big enjoying this amazing medivial atmosphere. Just off this amazing room you will find the large kitchen equipped with everything you would expect from a modern kitchen (cooker, fridge, washing machine, dishwasher, coffee machine etc) and big dining table with views out into the garden. 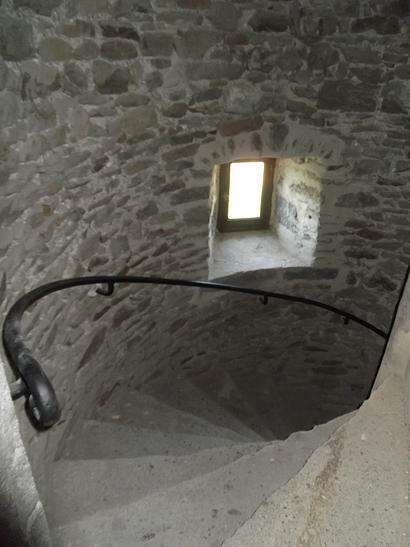 After climbing up the stairs to the fourth storey, you will reach a large room of 100 square meters where you can enjoy the amazing views over the valley of Aurillac. In the gardens around the castle, you can have a barbecue, with everything available in the Chateau to accommodate dining outside.